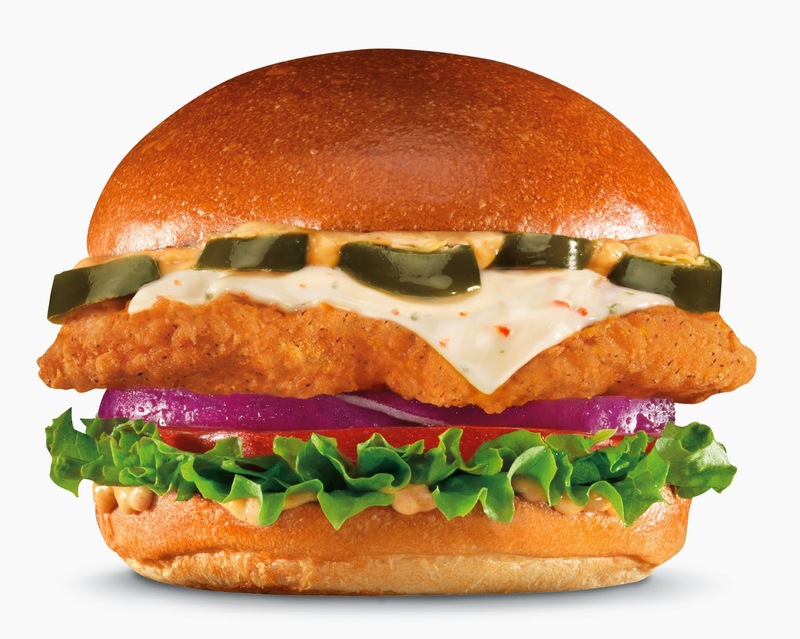 Hardee's and Carl's Jr. introduced their "Big Chicken Fillet Sandwich" in May and yesterday they added the 'hot' Jalapeno version. They both feature "a premium five-ounce chicken breast fillet seasoned in Southern spices, breaded and served on a Fresh Baked Bun with lettuce, tomato and red onion." The Jalapeno version adds "spicy jalapenos, pepper-Jack cheese and creamy Santa Fe Sauce." A bacon and Swiss version is also available. The 'Big Chicken' weighs in at 331 grams. That's more than the weight of 2 McDonald's Double Cheeseburgers. And it has a 'round' 800 calories and 45 grams of fat. The 'Big Chicken' has 2060 mg of Sodium, that's more than the amount of Sodium in 7 Large French Fries from McDonald's! Full nutrition information below.